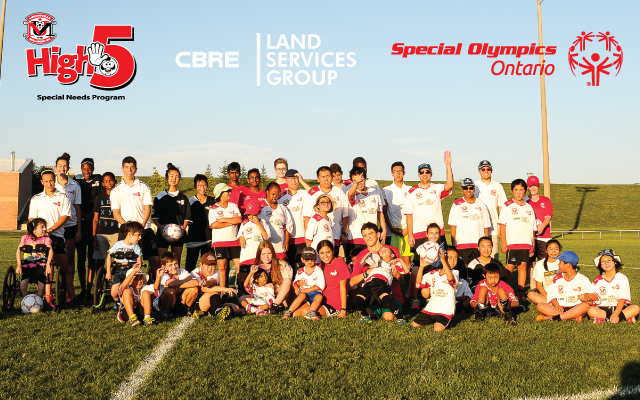 Unionville Milliken Soccer Club's High-5 All Abilities Soccer Team - A Partner in Play with Special Olympics Ontario! Welcome to the Unionville Milliken Soccer Club's High-5 All Abilities Soccer Team! (many who are youth ages 8 – 20) from Unionville Milliken Soccer Club competitive, recreational soccer teams as well as High-5! This mix of Athletes and Partner Players truly makes our program inclusive. We strive for a 1:1mratio for Athletes who work best in that environment and a 3:1 ratio for Athletes who would like to participate in small-sided games. Each Athlete is unique and their program is customized for them to have success. Unionville Milliken Soccer Club is proud that High-5 is open to ALL AGES & ABILITIES. FUN! Your Athlete will get exercise, touches with the ball and learn new skills each week in a positive, energy filled environment. SOCIAL! Being on a team is a great feeling, and our High-5 Team is Unionville Milliken Soccer Club’s most important team! Athletes and Parnter Players create a true bond of friendship, both learn from each other and look forward to seeing each other each week. PHYSICAL! Exercise is important for everyone, the High-5 Program encourages your Athlete to run, jog, jump, pass, throw, stretch… each practice consists of a warm up, individual skill session and the opportunity to play in a small sided game or continued 1:1 practice. All practices end with a cool down, stretch, Cheer for our Beloved Coach David Conforti and the famous “I LOVE HIGH-5 CHEER”! YOU TIME! Parents we recognize that you need some downtime and encourage you to come to High-5 and relax with other families in the community while your Athlete is having a great time. ATHLETES AND PARTNER PLAYERS! The unique structure of our program means that we strive to have 1:1 Athlete to Partner Player for those that need more support. Our youth trainers make it so much fun for the players since in many cases they are fairly close in age. Our Partner Players (volunteers) are spectacular! We would like to give praise to our long-time senior High-5 Volunteers who have been key to this program for the past four years! Thank you Keeley Aird, Stephanie Chin, Hamrish Saravanakumar, Genna Kontos, and Valentina Nivicki, we will miss all of these incredible volunteers as they head to University in Sept. 2019. Each one of these volunteers has committed to our team and make it a really fun, caring and safe environment that your Athlete can grown in. Saturday's 3:00 am - 4:00 pm - Please do your best to BE ON TIME. We pair up Athletes to Partners in the first 10 min during warmups. Athlese that are late will be put with another player and partner. Click here to JOIN THE HIGH-5 TEAM! A special thank you to our sponsor, CBRE's Land Services Group Executive Vice President Mike Czestochowski and his team - Jason Child, Ian Hunt and Lauren Doughty. Thank you for being a champion for the UMSC High-5 All Abilities Team!